In essence, most of Interior design is a matter of personal taste, but there are a few design principals that are fundamental to creating a pleasing design in any style. The most important part of reaching design nirvana is understanding the powerful effects of scale and proportion. Before we delve into the nuances of scale and proportion, let’s break down the terms and how they differ from each other. They’re commonly used interchangeably but there is a slight difference between them. Scale refers to the size of an object in relation to another object. It’s usually used when the size of one of the objects is a known certainty. When used in design, it’s typically used to reference the size of an object or space in relation to a person. Proportion refers to the general relationship in size between two objects. When you read or hear design tips like “the coffee table should be two-thirds as long as the couch” they’re referencing proportion. Scale and proportion work together to create harmony in your interior design. Furniture and artwork that’s at the right scale and proportion makes a room feel cozy and balanced. 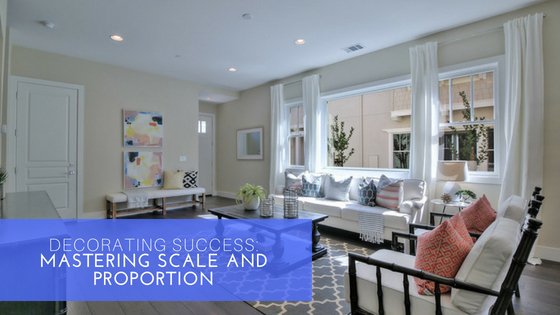 It’s not difficult to create correct scale and proportion in your home. Here are a few rules to follow to getting things just right. Size: Let the size of the room inform the size of your furniture and artwork. The general rule of thumb is the larger the room, the larger the furnishing and décor pieces it can handle. This goes the same for smaller rooms. This also applies to the size and amount of prints and patterns you’ll have in your room. Ceiling height: just like the size guideline, the height of a room will dictate the height of your furniture. There is an exception: furnishing a room with tall ceilings with low, modern furnishings makes for a dramatic effect. Choose a focal piece: The main item in a room will dictate the size of all remaining objects. For example, if you choose a large, overstuffed sofa, pick a more delicate side table to balance the look. White space: Resist the urge to fill every square inch of space with something. That just makes your room look and filled cluttered. Instead, allow for some white space (or empty areas) that allow your eyes to relax. These design concepts are fundamental to creating a great design, regardless of personal style. Next time you’re looking through design magazines or Pinterest, take a look at your inspiration photos and see if you can spot some of these design rules. These tips will help you make your home instantly look and feel glamourous.